Coronary angioplasty is a technique used to open up narrowed or blocked coronary arteries. It is carried out in a manner similar to cardiac catheterization. Plastic tubes are inserted through a large artery in your leg and advanced to the opening of the coronary arteries. Small balloons are then placed through these small plastic tubes (catheters) and slid down the coronary arteries to the level of narrowing. These balloons are inflated at the site of coronary narrowing, resulting in compression or flattening outwards of the cholesterol plaque and blood clotting substances that make up the blockage. Angioplasty has a high success rate of around 95%. Unfortunately, however, the narrowing may recur 5-10% of the time (this is called re-stenosis). It is possible to do second and third coronary angioplasties if necessary. Coronary angioplasty carries the same risks as cardiac catheterization. In addition, there is a slightly higher risk of myocardial infarction (heart attack) as the angioplasty may sometimes cause blockage of coronary arteries that are being opened. This risk is still low. 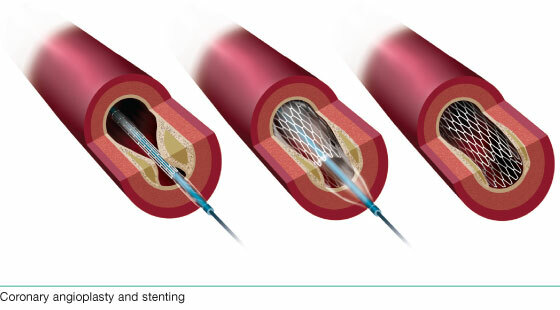 In some cases a drug eluting stent (DES) is used to further reduce the risk of recurrent narrowing of the coronary artery (re-stenosis). This improves the long term success of the angioplasty and stenting procedure. Patients undergoing angioplasty and stenting will receive blood thinning medications including aspirin and clopidogrel (Plavix). It is important to continue these medications for up to a year to prevent sudden thrombosis or clotting of these stents. In some patients with a bare metal stent (BMS) or drug eluting stents (DES) it may be necessary to continue the clopidogrel (Plavix) for longer than a year. Please check with your cardiologist or internist to determine how long you should stay on this medication. DO NOT STOP PLAVIX® ON YOUR OWN – ESPECIALLY IF YOU HAVE RECEIVED A DRUG ELUTING STENT (DES).